Generation Eight. The great great great great great grandparents. 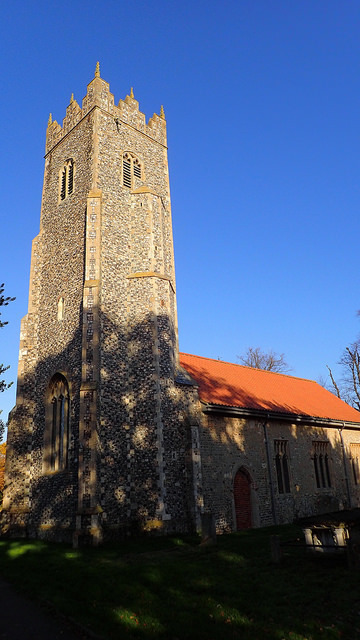 Above, the parish church of Strumpshaw in Norfolk. 5 x great grandparents (Generation 8)! Now that is difficult. My percentages really start to fall away at this generation - only 51% named (compared to 89% of Gen. 7). What a challenge. Edward Brucker. b.1757 Long Wittenham, Berkshire, England. Elizabeth Brucker (nee Gregory). b.1761 Long Wittenham, Berkshire, England. Mary Edney (nee Crutchfield). b.1740 Whitchurch, Oxfordshire, England. David Durran. b.1782 Steeple Ashton, Oxfordshire, England. Ann Durran (nee Lardner). b.1782. Lived Deddington, Oxfordshire, England. William Waine. b.1770. Lived Tadmarton, Oxfordshire, England. Elizabeth Waine (nee ?). Lived Tadmarton, Oxfordshire, England. Henry Baxter. b.1763 Dereham, Norfolk, England. Mary Baxter (nee Bennett) b.1763 Norfolk, England. Sarah Barber. b.1782 East Tuddenham, Norfolk, England. Elizabeth Harris. b.1768 Swanton Morley, Norfolk, England. John Smith. b.1731 Attleborough, Norfolk, England. Judith Smith (nee Dennis). b.1745 Coston, Norfolk, England. Richard Smith. b.1775 Attleborough, Norfolk, England. Mary Smith (nee ?). Lived Attleborough, Norfolk, England. William Hewitt. Lived Attleborough, Norfolk, England. Elizabeth Hewitt (nee ?). Lived Attleborough, Norfolk, England. John Freeman. Lived Attleborough, Norfolk, England. Anne Freeman (nee ?). Lived at Attleborough, Norfolk, England. Peter Peach. b.1730. Maxey, Northants, England. Mary Peach (nee Rippon). b.1734 Maxey, Northants, England. Peter Riches. b.1755 Old Buckenham, Norfolk, England. Mary Riches (nee Harrison). b.1756 Old Buckenham, Norfolk, England. William Snelling. Lived Carlton Rode, Norfolk, England. Mary Snelling (nee Lewell). b.1753 Kenninghall, Norfolk, England. John Goodram. Lived Morningthorpe, Norfolk, England. Lydia Goodram (nee Hammond). b.1749 Morningthorpe, Norfolk, England. John Curtis. Lived Hassingham, Norfolk, England. Ann Curtis (nee Annison). Lived Hassingham, Norfolk, England. John Rose. b.1775 Strumpshaw, Norfolk, England. Martha Rose (nee Rowland). b.1779 Strumpshaw, Norfolk, England. Benjamin Larke. b.1751 Cantley, Norfolk, England. Mary Larke (nee Marsh). b.1769 Norfolk, England. Thomas Dingle. b.1757 Moulton St Mary, Norfolk, England. Mary Dingle (nee Ginby). Lived Strumpshaw, Norfolk, England. Henry Rose. b.1779 Strumpshaw, Norfolk, England. Margaret Rose (nee Ling). b.1781 Acle, Norfolk, England. Benjamin Merrison. b.1759 Repps-with-Bastwick, Norfolk, England. Lydia Merrison (nee Norton). b.1774 Strumpshaw, Norfolk, England. John Briggs. b.1753 North Burlingham, Norfolk, England. Elizabeth Briggs (nee Jacobs). Lived Strumpshaw, Norfolk, England. Alexander Goffen. b.1705. Lived Rollesby, Norfolk, England. Anna Goffen (nee ?). Lived Strumpshaw, Norfolk, England. James Shepherd. Lived Reedham, Norfolk, England. Judith Shepherd (nee Maye). b.1749. Lived Reedham, Norfolk, England. William Nichols. Lived Halvergate, Norfolk, England. Elizabeth Nichols (nee Thurkettle). lived Halvergate, Norfolk, England. Thomas Tovel. Lived Wrentham, Suffolk, England. Hannah Tovel (nee Brown). Lived Wrentham, Suffolk, England. George Smith. Lived Toft Monks, Norfolk, England. Elizabeth Smith (nee Wittham). Lived Toft Monks, Norfolk, England. James Porter. b.1727. Lived at Blofield and Limpenhoe, Norfolk, England. Elizabeth Porter (nee Mollett). Lived at Blofield and Limpenhoe, Norfolk, England. William Springall. Lived at Strumpshaw, Norfolk, England. Susanna Springall (nee Mingay). Lived at Strumpshaw, Norfolk, England. Jacob Wymer. b.1756 Moulton St Mary, Norfolk, England. Elisabeth Wymer (nee Moll). Lived at Moulton St Mary, Norfolk, England. John Thacker. b.1764 Woodbastwick, Norfolk, England. Ann Thacker (nee Hewitt). b.1774 Salhouse, Norfolk, England. Abraham Daynes. Lived at Wicklewood, Norfolk, England. Elizabeth Daynes (nee Moore). b. 1748 Wymondham, Norfolk, England. Robert Page. b.1752 Wymondham, Norfolk, England. Elizabeth Page (nee Hardment). b.1751 Bunwell, Norfolk, England.